Publisher: Namco Bandai. Developer: Ninja Theory. Released: October 2010. Genre: Action/Adventure. 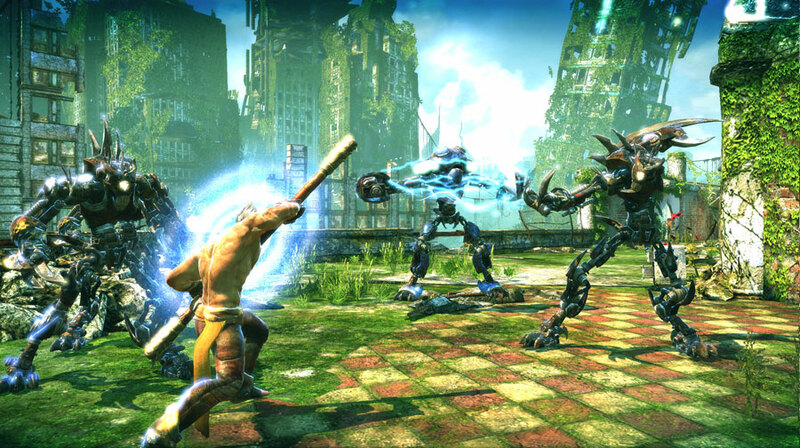 In many respects, Enslaved comes to embody the best and worst of what gaming has so far had to offer during the HD generation. The game’s beautiful, elaborately designed jungle vistas are testament to what can be achieved with artistic vision and effort, whilst there’s something distinctly Hollywood about its action set-pieces. The bangs and whistles are so effective that, at times, it’s easy to overlook the fact that the gameplay itself is fairly thin on the ground. A failure to get many of the basics right and the restrictive nature of the adventuring leaves it feeling like a case of style over substance. A third-person action adventure set 150 years in the future, Enslaved pits you as staff-wielding Monkey who, after fleeing an aircraft transporting slaves, crash lands to earth on an escape pod. When he comes to, he has rather inconveniently been fitted with a slave headband by Trip, a woman who seeks his protection from the mech presence as she wishes to return to her village several hundred miles away. Protecting her is paramount; if she dies, the headband will terminate Monkey, the same being the case if he strays too far from his captor. 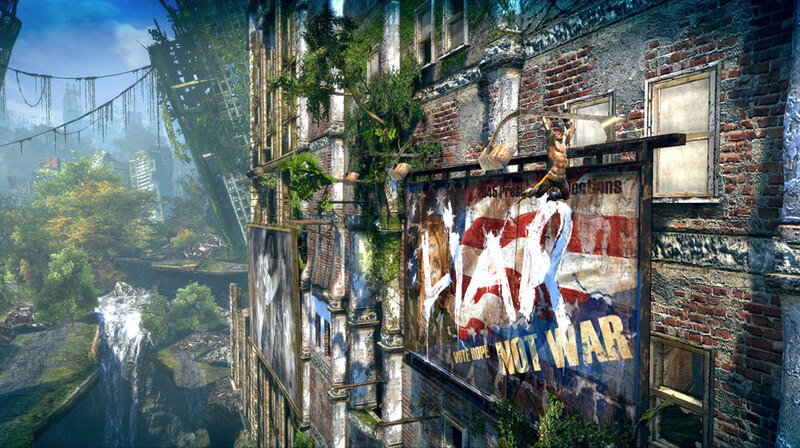 Developer Ninja Theory deserves credit for devising a new intellectual property that offers such a pretty, distinctive envisioning of a post-apocalyptic Earth. Not just because of how good it looks, but also that it avoids the generic template of arid dustbowls and sandy landscapes the film industry has become so fond of in the last decade or so. Mankind is scare, hiding from or imprisoned by robots that maraud around the jungle canopies, whilst tell-tale signs of a past war are in evidence through mines and the dilapidated remnants of man-made structures nature has long since reclaimed, whilst mechanised dragonflies flit around the treetops. It’s very evocative. Whilst the story isn’t anything overly memorable in itself, the chief reason for sticking with it is that both Monkey and Trip are excellent and very likable protagonists. They’re well-voiced by their respective actors Andy Serkis and Lindsey Shaw, and make for a classic “opposites attract” pairing, trading some fun dialogues. Furthermore, they manage to carry the majority of the narrative on their own, which makes for quite a refreshing change in an era of questionable side-kicks and pantomime villains, and the ending is also surprisingly well-handled. There's a good boy Rex. Now, for the love of God, sit. In terms of visual design, the game is first-rate. Within minutes of the start, you’ll be running across the wing of a slave ship that is plummeting to a nasty end. At one point, the ship turns on its side, leaving you to scramble desperately up before the wing catches a skyscraper that all the while looms closer in your periphery vision – a genuine “wow” moment. The water effects are great, and the vibrant use of reds, blues and greens make the environments glow with vitality. There’s little variety in the robot design, but they still look the business, whilst the bosses are suitably menacing, particularly the Dog with its giant metallic gnashers. It isn’t as technically robust as it should be however, with that all-too-familiar air of a multiplatform title not built to the strengths of the PS3. It doesn’t produce as much graphical clout as the likes of Uncharted 2 or Resident Evil 5, and yet struggles to run what it does produce with consistent smoothness. The frame-rate lags now and again, whilst some of the scenery, particularly in cut-scenes, is slow to display its textures, as you see layers of scenery hastily appearing over green blobs. To encapsulate Enslaved: Odyssey To The West’s troubles in one sentence, it’s that it’s more fun to watch than to play. Purely to look at, the adventuring hijinks and setting share traits with similar such games as Prince of Persia and Uncharted, which you could argue is no bad thing. The problem is, the gameplay itself isn’t in the same league. The platforming is dull, as jumping between poles and ledges is so regimented that it requires almost no thought; there aren’t any red herrings, very few danger points and as Monkey never jumps in a direction whereby there isn’t something for him to directly grab on to, it’s virtually impossible either to die or indeed go anywhere except where the level is taking you. Apart from a couple of instances late on that require some degree of timing, you feel a passenger to a game that frequently gets carried away on a wave of spectacle – as if many of the sections were designed with the mantra of 'what looks cool' rather than 'what plays well'. On the ground, Monkey is clumsy to control thanks to an extremely suspect turning circle and a propensity for getting snagged on scenery, whilst standard leaps are pretty unresponsive too. Monkey is apparently very selective with where he wishes to climb/dismount ledges, which is an enduring annoyance in locations that give the illusion of being freely explorable. Trip can be issued commands that are promising enough to begin with, like instructing her to distract droids whilst you move to a better vantage point. But beyond a couple of instances of telling her to pull leavers or flick switches, nothing especially adventurous is ever made of the buddy system. Trip’s best feature involves her being able to upgrade Monkey’s health, shield and combat abilities, something the player benefits from through the collection of tech orbs found all over the levels. In fairness, Trip’s not the liability many A.I. controlled allies are, and for the most part she stays out of trouble, but the rinse and repeat nature of having her distract turrets whilst you run in behind, hijack them and shoot everything in the area gets dull pretty quickly. The combat is similarly competent but rather run of the mill. If you wish, you can 'go Kratos' on the droids and hammer the square button for a while as you beat them into submission with a limited range of staff combos, or use the staff in its more interesting and fun guise, as a bow. This supports stun ammo (for taking down shields) and more lethal blasts, useful at a distance for bagging headshots and the like. 14 chapters of play generate a reasonably uniform modern adventure game lifespan of around ten hours or so. 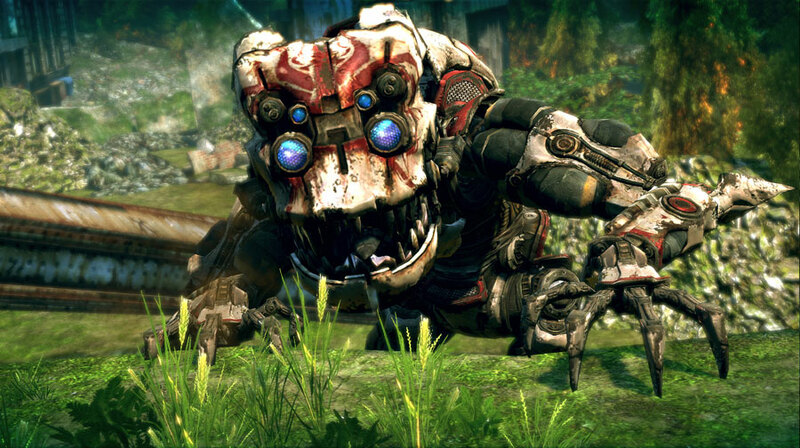 There’s the occasional boss, the most entertaining of which being the Rhino mech, which must be coaxed into charging at Monkey in such a manner that it instead crashes into various bits of hazardous scenery. Three difficulty settings offer a broad radius of challenge, though most will be discouraged from going for the Platinum trophy due to the ludicrous challenge of collecting every single last tech orb (of which there are hundreds, possibly thousands within). Such incentives aside however, one play-through will likely be enough for most, as due to the extremely linear nature of the levels, it’s unlikely you’ll witness anything of note second time around that you didn’t spot to begin with. 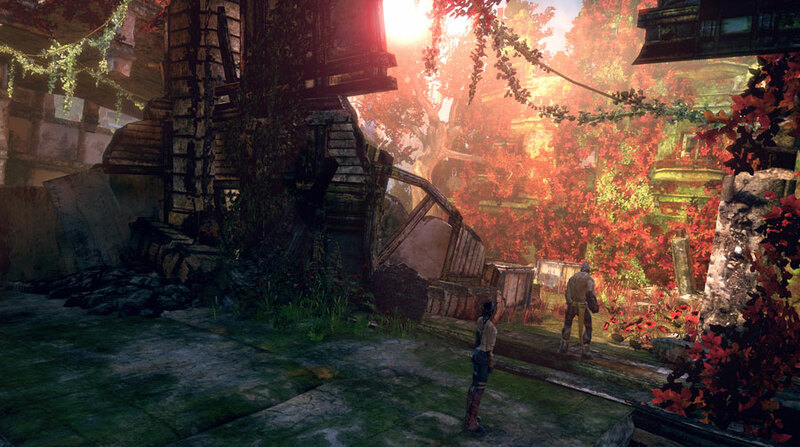 Enslaved: Odyssey To The West is an okay adventure set within a very appealing game world. Purely for the spectacle and a great cast of characters, it’s worth a go. But whilst a few new concepts are tentatively ventured, there isn’t the depth of play to really make them work, and all of the familiar adventuring tropes have reached considerably higher standard elsewhere. The combat works fine but is unremarkable, the platforming unadventurous and without challenge. Good, but not great. "The bangs and whistles are so effective that, at times, it’s easy to overlook the fact that the gameplay itself is fairly thin on the ground"